WASHINGTON (CNS) — A Catholic congressman fresh from a fact-finding trip to East Africa, conscious of the human rights concerns brought on by famine and military violence, aims to increase funding for affected areas and urge reappointment of a special envoy to the region under the Trump administration. 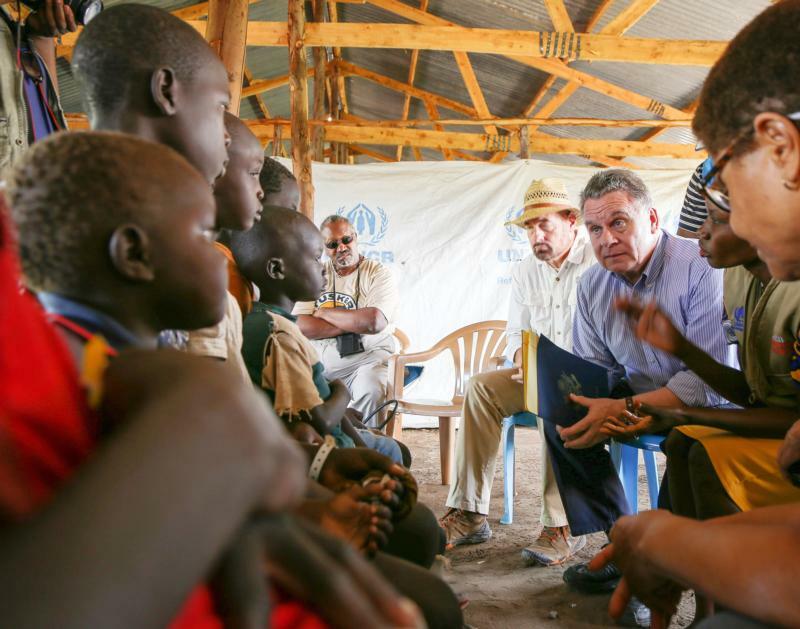 Rep. Chris Smith, R-New Jersey, recently returned from leading a congressional delegation to South Sudan and Uganda. Along with Rep. Karen Bass, D-California, Smith traveled to East Africa to address the famine and violence plaguing the area. “Now if he (Ajongo) can succeed and inculcate the values of protection and human rights observance within the military, from the generals down to the private, I think there will be a transformative change in the country of South Sudan,” Smith said. Despite the magnitude of this crisis — about 3.8 million people have been displaced and at least 28 million people are in need of food aid — few in the United States are aware. Affecting not only those native to Eastern Africa, the human rights abuses carried out by military members have also been directed toward visiting relief workers. Among the atrocities perpetrated was the July 2016 raid on the Terrain hotel complex, during which South Sudanese soldiers raped and beat foreigners and killed a journalist. Senior member of the House Foreign Affairs Committee and chairman of its Subcommittee on Africa, Global Health, Global Human Rights and International Organizations, Smith has visited East Africa twice now in two years, his previous visit taking place in August 2016, during which he spoke with Salva Kiir. “In the meeting last August, we stressed with him how important it was to not only hold the perpetrators of this to account, but also to have a zero-tolerance policy that is enforceable for his entire security and military apparatus,” Smith said. Smith lauded the efforts already being made in South Sudan by Catholic Relief Services, the U.S. bishops’ overseas relief and development agency. Along with several United Nations agencies, CRS has been making great strides in the effort to combat the crisis, helping to provide food, water and health assistance in the areas affected. Smith also called for the faith community to further ignite reconciliation in the area for healing to begin. Though he explained that the famine in South Sudan has largely been the product of military unrest, Smith echoed concerns which Pope Francis raises in “Laudato Si’,” the encyclical addressing humankind’s duty to “Care for Our Common Home,” as the document’s full title says. As efforts increase to bring electricity to Africa, Smith calls for an environmentally conscious path forward. “My hope would be that we do it in the most environmentally sane and safe way, and that means that clean energy, biomass, where possible, certainly photovoltaic cells, solar, all provide part of the mix going forward,” Smith said. “When you talk to somebody who’s just a matter of feet away, dialoguing and trying to have a meeting of the hearts, it makes going out and using guns and knives and weapons to destroy that much harder,” Smith said.